"When I arrived in Berlin in August 1945 and saw the destruction I knew just how lucky I'd been." Berlin-born photographer Heinz Ries no longer calls himself Heinz, but Henry Ries. Now a naturalised American living in New York, as a Jewish German he fled from the Nazis to the United States in 1938. A Tale Of Two Cities accompanies the 82-year old Henry Ries on a visit to Berlin in the summer of 1999. With a box full of old photos under his arm he revisits the places he had photographed before and after the war. The film is not only about Henry Ries, who once again travels through Berlin with his camera, but also, through the eyes of a former Berliner who was robbed of his city by the Nazis, accurately reconstructs the city's history at selected locations. A stroll with a man who, decades on, photographs the "new Berlin" and finds a "second" city. 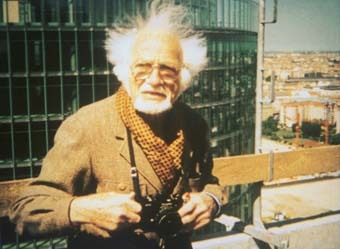 Manfred Wilhelms was originally a painter and photographer before undergoing a complete metamorphosis into a self-taught filmmaker and cinematographer. As a part-time student, he took part in seminars given by Helmut Faerber on the films of Griffith, Ozu and Renoir. He has made numerous short TV features and the documentaries: Licht singt tausendfache Lieder (1985), Die Loreley (1988), Menschenrechte (TV, 1989), Rostige Bilder (1990-1992), Route des Crêtes (1993), Die Rennstrecke (1994), Laufen um zu leben (1995). His omnibus film Berlin - You Stranger, You Beauty (1995-2001)includes the following films: Berlin - Pictures of a City ,A Tale of Two Cities, The Legend of Potsdamer Platz, Nightwalk, Street of Culture, Pictures of a Veiling, and Where is the Flair.